The Department, Staff Selection Commission SSC has notified all regarding the releasing of SSC GD Constable Posts in various departments. SSC GD Constable 2018-19 Admit Card is for the post of Constable (GD). A great no of candidates has been noticed to registered for SSC GD Constable Recruitment 2018. No of vacancies are also huge 54953. Candidates who have applied for SSC GD Constable recruitment are eagerly waiting for their SSC Hall Ticket and exam dates as well. So, the department has now released the SSC GD Constable Admit Card 2019. And it is available on the official website of SSC Staff Selection Commission. Candidates can now able to download it from the official website. SSC GD Constable exam date are available on the official website. SSC Admit Card download link is available on this article as well. Constable GD Admit Card Date is placed in the table below along with some important links contains some other tentative dates also. SSC GD Constable 2018-19 Admit Card is available on the official website of i.e. https://ssc.nic.in/, you can visit there and check out other essential information. Each candidate who wants to attempt the SSC GD Constable exam has to carry the SSC GD Constable Hall Ticket with them. SSC GD Constable 2018-19 Admit Card is one of the most important documents in this recruitment. 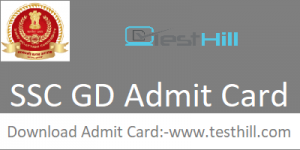 SSC GD Admit Card 2018 date is 11th February 2019 to 11th March 2019. In case of any query or information candidates can contact the officials before the exam day. Candidates must appear in the written exam to grab this post. Aspirants can download via two modes by Registration Number or by Roll Number. Admit Card contains some important information regarding the candidate and exam-like candidates parents name, examination venue address, exam date and time etc. SSC GD Constable Admit Card 2018-19 will be available soon. Candidates can download it by following the given steps. Give the required information such as DOB, Name, Registration no etc. Read all the instructions carefully before submitting it. Take a screenshot or save the PDF file for examination purpose.